OK, so it didn't go quite as well as I hoped but I guess I shouldn't be surprised. I knew when I made the decision to do my 100 mile training week just 3 weeks before the race that I was probably killing any chance of a fast time but it's what I wanted to do so I have no regrets. Just make a note that when preparing for a fast marathon , do not run a 50k race 5 weeks before, followed by a 102 mile week and then do two more weeks of 49 and 48 miles and call it a taper. The weekend itself was wonderful. I was once again a guest of Mike and Lisa Howell at their home in Kill Devil Hills, just a block away from the race course. It was a beautiful weekend except for some strong wind on Saturday which we spent goofing off all day. 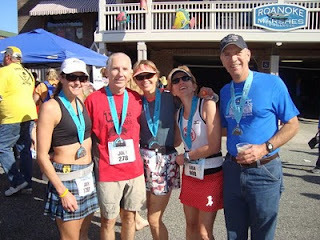 Mike dropped Lisa and I at the start Sunday morning and we quickly found Karla and Amy and also spent some time talking to Bill and Sally Squier. After chatting a bit I ran a short warm up and made my way to the start. They had a lady that did the most incredible job of singing the National Anthem that I have ever heard. Simply awesome and inspiring. Once the race started I settled into an easy feeling pace, just letting people pass me and trying not to get sucked into to speeding up. The first mile was still a little faster than I had wanted in 8:32 but at least not over my goal pace of 8:23. After that I fell into a nice rhythm and was steadily clicking off the miles , all within a few seconds of my goal pace. But just like last year it soon became obvious that I was not going to be able to hold that pace comfortably much longer. Just as we were entering Nags Head Woods , I shut it down at exactly the same place as last year. I was surprised that Lisa passed me there ,well ahead of her goal pace. I knew she would be along shortly but not that soon. Unlike last year I was not going to just slow down and hope to still run a fast time. That didn't work out too well as I blew up hard and suffered mightily the last 8 miles or so. This year I just decided to get to the finish as comfortably as possible so I began walking the hills through the woods. Once I came out of the woods and back onto the flat roads I took a short break and two gels at the mile 13 aid station before beginning a run/ walk strategy of walking one tenth of a mile and then running nine tenths. Each mile I began looking back to see if maybe Karla was coming so I could run some with her. I even considered just walking until she caught up to me but I was hoping she was going to have a good day and would catch me soon. So that is how the last half went with me just trying to enjoy the day. Around Mile 20, Amy passed me looking strong and I knew she was on her way to a pr. I never did see Karla and after one more look back just past mile 25 I ran it on in to the finish. My time of 4:28 was almost exactly the same as last year but a lot less painful. I was talking to Mike and Lisa in the finishers corral when I looked back and saw Karla. She actually ran one minute faster than me but had started in a later corral or we could have been able to at least run a little together. Lisa would slow down a lot the 2nd half but still improved her pr by about 2 minutes with a 3:56 finish. Amy ran strong and got a pr in 4:06. Frank ran his usual 2:15 in the half and his son Eric running in his first half did 2:07 on less than two weeks training. 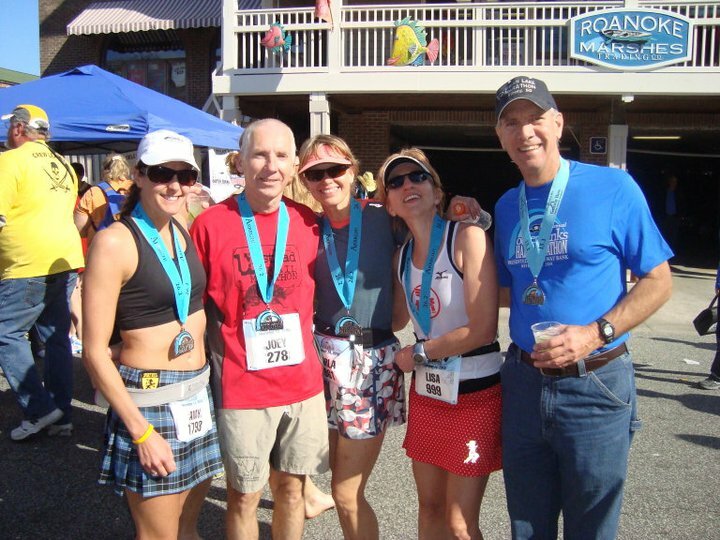 OBX is a great race and I have been happy to run it 4 times now. Unfortunately I don't know when or if I will get around to running it again. There are just too many events in November that I want to run and next year for sure I will be returning to Mountain Masochist, one of my favorite events. Sounds like a nice day . . . just cooling it and having a nice run! Add one more to the books!